The deadline for the Call for Participation of the Berlin Desktop Summit is approaching. The deadline for submitting proposals for presentations and lightning talks is tomorrow. So you still have the chance to submit a presentation and talk about your work on the free desktop at the wonderful event in Berlin that the desktop summit promises to be. It takes place from 6th to 12th August this year and combines the annual conferences of the KDE and GNOME communities. Some of you might think that your contributions to the free desktop to the event are not relevant enough to warrant submitting a talk. That often is not true. While we will have well-known speakers who have done ground-breaking things on the free desktop, we all have started small, and sometimes especially the small projects, which are still young, are the most interesting ones to hear about. So please don't hesitate to try it, submit a presentation, talk about the projects you are passionate about, share the love for the free desktop with the community. Berlin is the right place for this. It began about ten years ago, when I rewrote the KDE address book library. I implemented a nice API, vCard parsing, and a representation of something I called an Addressee back then, a contact, the data belonging to a person or any other entity, closely modelled after the fields of vCard, which is a fine standard for storing and exchanging address book data. We wrote KAddressBook as an application to manage contact data on top of the address book library, and while it's a nice and useful application, in some ways it still follows to some degree the technical thinking coming from the structure of the underlying implementation. This shows in the user interface, and makes it less useful, attractive, and intuitive as it could be. So I thought it would be a good idea to experiment a bit and approach the task of handling people data from the other direction. Ignoring technical aspects of the implementation, or constraints of underlying technology, but thinking from a user's point of view, thinking about what's a natural way how to deal with this kind of data. I started to think and code a bit, and during Hackweek 6 I went on and got the application I started to a level where I think it's time now to share it and gather some more feedback. But before I come to the application itself, here is some of the motives and concepts behind it. The first thing I did was trying to come up with an idea of what the mental model is how people think about people. The way address books usually present this data is practical in some ways, but when you think about other people, do you have an alphabetically ordered list of names in your mind? Probably not. So I collected a list of concepts, which better address the mental model of people. Groups. People usually belong to some groups. There are colleagues, friends, familiy, the weird group of hackers you hang around with on IRC. 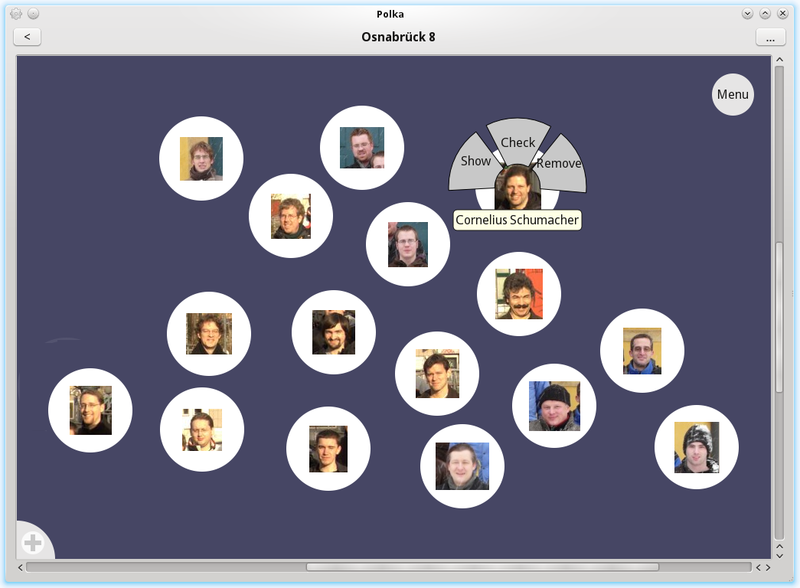 These groups are often used to classify people, and provide a pretty solid way to structure how you organize people, the KDE guy you met at last year's Akademy, the colleague who used to study with you at university. People often belong to multiple groups, and sometimes there is no clear mapping. Pictures. When thinking of people you usually have some kind of picture in mind. You would recognize most persons you know on a photo without effort. Pictures are widely used to identify people, and pictures of people, especially of people you have a closer relation with are easily available from various sources now. Fuzzy information. In many cases the information you have about other people is somewhat fuzzy. You might not know the exact address, just a city. You might only know a nickname, or the date of the birthday, but not the year, or you might have trouble assigning the parts of a foreign name to the fields of a technical address book. Is it a middle name or is it part of the given name? Is this the surname, or maybe a suffix? While it's nice from a technical view, to have this exact classification of fields of a record, in practice and from a human point of view, it often just is neither possible nor important. Humans deal with fuzzy information pretty well, especially when dealing with other people. Time. An important factor to classify information is time. You remember that you met a person at a certain time. When having multiple phone numbers available, the time, when you got them, will give an important hint about which one is more likely to work. In general, knowing when something changes, helps a lot with navigating information. Space. Another important factor is space. You think of people being close to each other, either physical, as in neighbors, or in a logical way, as in family. A family tree is a great example how space is used to organize and structure people. There are also numerous other ways how to relate people in a spacial configuration. How they appear on a photo, a seating order for a celebration, and many more. In addition to coming up with a way how to meet the mental model of how people think about people, I also wanted to take benefit of having available the power of managing the data on a computer. There are many address book applications which resemble paper address books, going as far as mimicking the texture of the leather cover. But being able to manage the data electronically without the restrictions of paper, leather, and spiral binders, gives some unique freedom and potential in a couple of areas. Ubiquity. As it's so easy to store, transmit, and distribute data electronically, data can be ubiquitous, it can be available at work as well as at home, or when being on the road, on your laptop, phone, tablet. It can live in the cloud, easily accessible from everywhere. History. Without the restrictions of paper, there is no reason to ever delete data. You can keep an unlimited history, which gives you the safety to always being able to go back, if you have changed something you later realize you didn't want to change, or if a need to access old data arises. This all can be done in a way, which hides old data from the current view, to not clutter the most recent view you normally use. Low-cost editing. With electronic data, the cost of editing, rearranging, duplicating, and deleting data is very low. You can easily duplicate a set of entries about people to do some rearrangements, and then delete it again after a few minutes without loosing anything. No striked through entries, no wasted pieces of paper, no mess of failed attempts to get something done. This provides the opportunity for ad-hoc editing, especially if combined with some kind of history. Connect to the cloud. A ton of personal data lives in the cloud, on various web sites, in structured and not so structured ways. With Facebook, Google, Linkedin, your corporate directory server, the data on your private mail account and much more, you have access to a lot of data from the people you usually deal with. By putting an application at the right place, you can connect all this to represent your personal social network. Finally I wanted to go beyond the standard user interface of current address book applications. There is much value in standardized interfaces, taking into account style guides, using standard components, and all the other good stuff of working in a nicely defined, consistent, and integrated environment. But I wanted to experiment with leaving this behind and trying some non-standard concepts. So I decided to not care much about standard widgets, to get rid of everything, which was non-essential to the actual application, to use animations gratiously to make the interface dynamic and support the user in understanding transitions. I also decided to try a new kind of menu, which isn't seen much on desktop applications, but could give more direct access to the actions the user needs. Finally I also decided to create a UI, which is not limited to a specific form factor, but can deal with a variety of devices, not only classical desktops, but also stuff like tablets, or maybe even phones. Now that you know where I came from let me introduce you to my experiment. I call it Polka. It's an application for dealing with people data based on the concepts I described, thinking from a user's point of view, matching the mental model of how we think about people, and not caring too much about the current status quo in terms of address book applications. I summarized that in the FATE entry for my hackweek project, where I called it the humane address book for the cloud. The title came from the idea to approach an address book not from the technical point of view, but from what is relevant for human users, and to tie it to all the data and functionality which is available in the cloud. I started to think about this quite some time ago, and did write some code here and there, but during last hackweek I made the effort to actually put it all together and polish it so that it hopefully adequately illustrates the concepts I wanted to experiment with. Let me explain some of the main elements of Polka. The central part of Polka is the group view. It shows a group of people and possibly some sub groups. The display is based on people's pictures and makes use of the view as a kind of canvas, where the members of the groups can freely be arranged. Names are shown for entries where no picture is set, and they are shown for all entries, when hovering over with the mouse pointer, so it's easy to identify people. By default all people are shown in a compact regular arrangement, but you can simply move all entries around to create a different arrangement. The next screenshot shows an example. It's the group of people, who attended the Osnabrück 8 meeting. The arrangement reflects where people were on the group photo. That's just one application for arranging people freely. You could also reflect breakout groups, seating orders, a family tree, or any other relations between people. The basic idea is that you use space to naturally reflect how you are thinking of people. People can be added to as many groups as needed, and any group can contain other groups with the same or different people. The arrangement of people is specific to the view of the group, but the entries of people are always the same, they are just links, so a person can appear in multiple groups, but the data is only there once. For menus and getting access to actions in general I wanted to experiment with something different than the classical menu bars and context menus, and see if I could find a way to make it more natural and direct to work with the elements shown in the user interface. So I got rid of all traditional menus, no menu bar, no status bar, no right clicks. In the previous screen shot you can see how you get access to actions for a person. If you hover over a person, there is shown a fan-like menu, where you can select some person-related options. For general options there is the "main" menu disk at the top right, which also shows actions on hover. You can also click on the canvas to get options which are related to a certain location like adding a label. This all is pretty simple, and you don't even have to be very exact, when hitting a menu, so it probably would also work with a touch screen, although I didn't try it, so take this with a grain of salt. When you click on the "show" menu item, a detailed view of the person is shown. It includes all the data you store about this person. This is the usual contact information, but most of it is stored in a relatively free form. You don't have to identify components of the name or the address for example. They are just text fields. You can also easily add free form text by adding comments to every field of the person's data. The speech bubble indicates where a comment is there, and you can add general comments to the person's entry. All this helps dealing with the fuzziness which data about people often has. When you hover over a data field, some editor controls are shown to comment, edit or remove the field, and the information is shown when the fields was modified the last time. This way you can judge, which fields are relevant, and which ones might be outdated, and it also can help with putting the entry in the perspective of time, they might be related to something which happened at a certain time you remember. An important element are the pictures of the person. 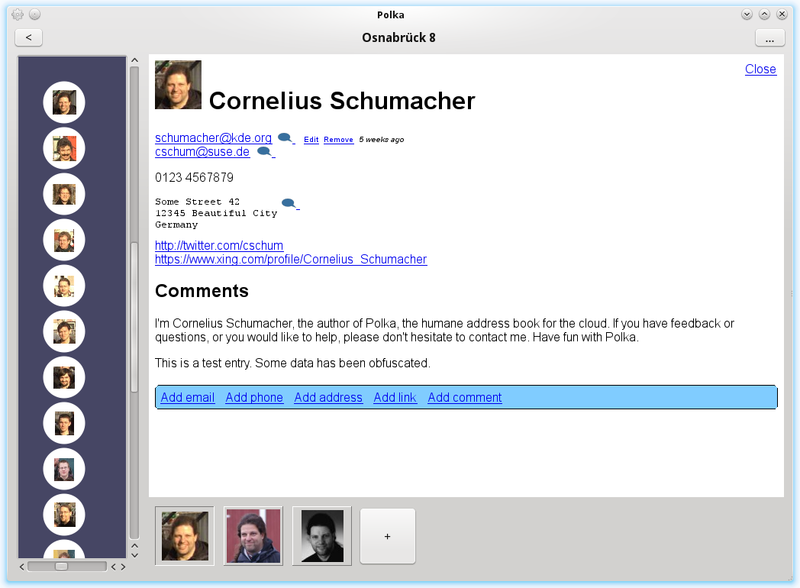 Polka collects pictures from different sources on the web, e.g. from your Twitter profile, and you can easily add more pictures by using a built in screenshot function. So if you see a picture of a person on a web site, in your mail client or any other place, you can just capture it directly from the display without having to deal with saving image files or getting URLs. What the screenshots don't show is how the views transition. It's all done dynamically with animations converting between views of different groups or when the details of a person are shown. This makes it easier to keep track of what belongs where, and also is fun, because it looks and feels nice and smooth. Polka takes care of saving data in the background. The user doesn't need to know or think of that at all. All changes are saved and the complete history of changes is preserved, so data is never lost, and there is no need for confirmation dialogs or anything like that. The data can also be shared via a server, including the full history. So all your people's data is always available and shown in the same way, no matter where you are. Storing the history also makes it possible to have unlimited undo, even across different computers. But I haven't implemented any user interface for that yet. 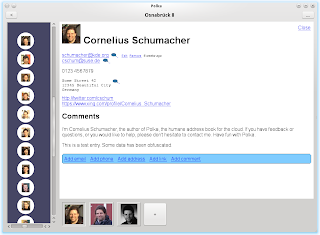 So much about what Polka does and how the user interface looks and behaves. Although the implementation is not that important, it is working code, so some technical details might still be interesting. The data is stored in an application-specific XML format, including all the meta data like comments, when something changed, the position of objects in the views. So everything is in one place and can easily be versioned and shared. The interface to the XML is generated via kxml_compiler from an example XML file. So there is a native API to access the data without having to maintain the code to read and write the XML and represent it in C++ objects. To store history and for sharing the data across machines, everything is stored in a git repository. Every change is recorded, so the full history is available in the git history. Git is amazing as a storage backend. As it's so fast, it's not really noticable that storing data is more than just writing a file, and by using git's distributed nature, sharing the data and its history with a server and across different machines comes almost for free. The UI is implement with QGraphicsView and the Qt animation framework. I thought about using QML, but as C++ is my native language, using QGraphicsView directly seemed like the more straight-forward way to me. The implementation separates models handling the data and the views reasonable well, though, so adding a QML based view should be possible without too much hassle. For the person's view I use Webkit. The data is rendered as HTML and CSS and shown in Webkit. This gives some more flexibility and power than a widgets or QGraphicsView based view, and also opens a path towards the web. I tried again to write a small library to make it convenient to generate HTML and CSS. It's better than some of Spaghetti code I wrote in the past for this purpose, but it still doesn't match the elegange of for example some of the Ruby based solutions for this. It's a pretty tough problem in C++. Other than that it's a pretty much standard KDE application. It doesn't make too much use of the platform, though, as I consciously didn't use many of the standard UI elements. The code for Polka is available at git://anongit.kde.org/scratch/cschumac/polka.git. It's still experimental, so use with care, although by the use of git as a storage backend your data is pretty safe. I don't have specific plans for making a release or making it a more official part of KDE right now, but will continue to use it as a playground for trying out concepts and maybe provide some inspiration for other projects. I am interested in feedback and comments. So don't hesitate to contact me, if you have questions, ideas, comments, or suggestions. So I'm at the end with this blog post, and while it is a very long post, there is still a lot to tell. For now I'll let the code speak, and maybe I'll blog again later to discuss some more details about specific aspects of Polka.